This my MIL's go to salad. I think in Maharashtra it is called koshmbair. It specially goes well with spicy North Indian curries . The radish in the mix gives it a very unique earthy peppery taste which i love but if you find white indian diakon radish a little over powering use small red radish for a milder taste or if you totally hate radish :) it works with cucumber alone too. I usually will put a tempering over it just before serving but tastes good without too.. 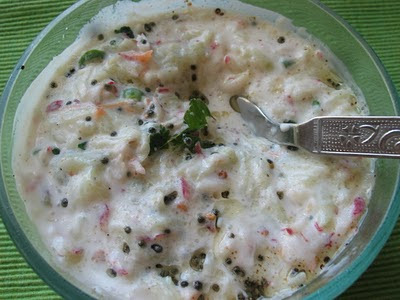 I'm sending this to Divya's Salad event.And ha this makes a good dip for chips too. 1. Cucumber , radish , green chili , curd ,salt . 2. Heat oil add mustard ,when it pops add urad dal or cumin . 3. Cook for a minute and pour over the mix. 4. Add cilantro and mix everything well. 5. And the salad is ready to serve. I have used small red radish here as i didn't had white diakon on hand but i personally prefer white diakon in this recipe. this looks really yummy..must try. Yummy salad! And congratulations on your award! Nice recipe! thanks for visiting my space! Hi nisha I htink I am first time here.. 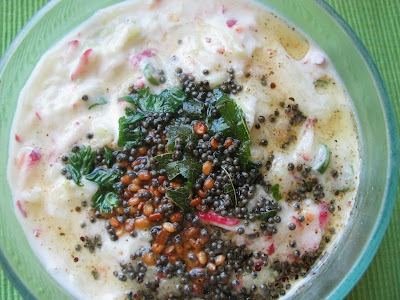 I loved this radish and cucumber combo and I never attempted with this combo for making raita.. truely nice one will do it immediately as i have both on my fridge. All your recipes are wonderful and will be here often.